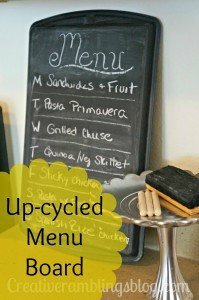 A couple weeks ago I started menu planning with my family. I had an idea of how it could simplify our lives and save us some money, and sure enough it has already! 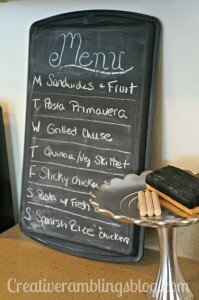 I only buy what we need for the week, I’m not throwing out spoiled food, I’m spending less at the grocery store, and I’m not stressing about dinner come 5pm. 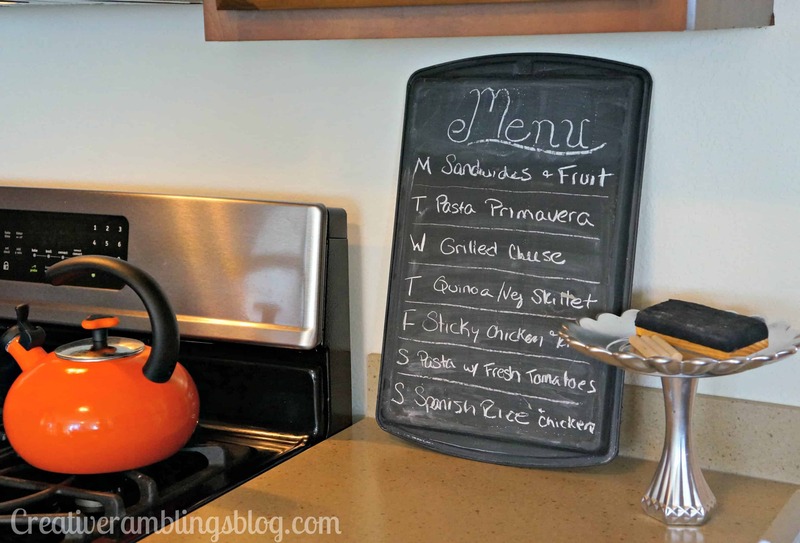 Now that we are in a routine I need a better way to display our menu and keep a running grocery list. Currently our menu and list sits in the middle of the kitchen counter on a scrap of paper. I’ve lost it once this week; gotta find a better way. 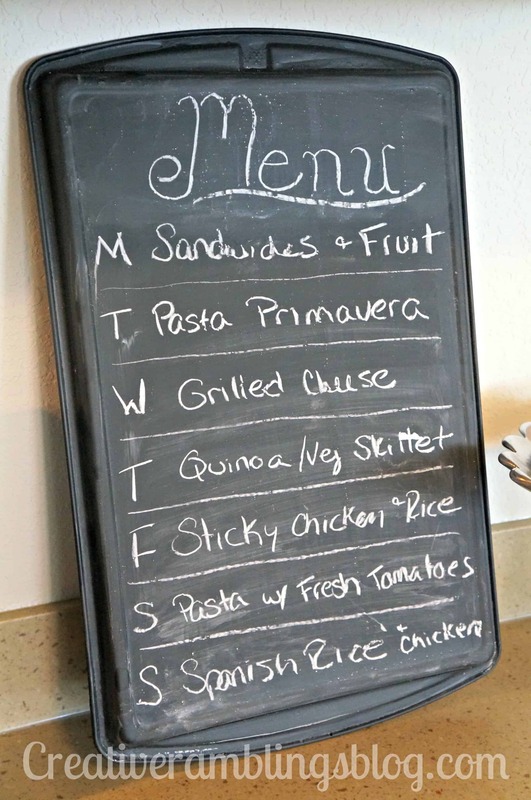 I am in awe of the kitchen menu boards and command centers I see on Pinterest. I would love to make a big bold statement with this. But most of these are permanent in that I would have to drill a few holes in the wall and/or paint a portion of my wall. Too much commitment for me. Then I stumbled upon this little gem. Cookie sheet kitchen command center. From what I could figure out this was submitted to a contest at one point. I found the creator but no original post. A cookie sheet painted with chalkboard paint….how easy! And so not permanent. It helps that I recently retired a couple pans that just aren’t suitable for baking anymore. I cleaned the back of a pan, but it still has a couple scratches and nicks that can be seen through the finished paint…adds character right? Then I addded a metal primer and one coat of chalkboard paint. That’s it! For now I’m not hanging it on the wall, it will be propped up next to my stove so I can see it from anywhere in the kitchen. Next step is an organized accessible grocery/to-do list. I’m creating a template which, if it turns out pretty, I will share with you soon. 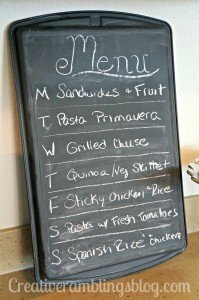 For those of you that menu plan, how do you stay organized? I’d love to hear about your methods. Hey Christine, glad you came by.